MenuBarItem presents a Menu within a MenuBar. The respective drop-down menu is shown when a MenuBarItem is triggered via keyboard, mouse, or touch. MenuBarItem is used as a default delegate type for MenuBar. Notice that it is not necessary to declare MenuBarItem instances by hand when using MenuBar. It is sufficient to declare Menu instances as children of the MenuBar and the respective items are created automatically. See also Customizing MenuBar, MenuBar, and Menu Controls. This property holds whether the menu bar item is highlighted by the user. 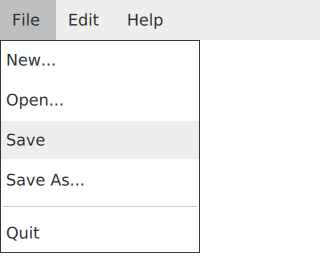 A menu bar item can be highlighted by mouse hover or keyboard navigation. This property holds the menu that this item presents in a menu bar, or null if this item does not have a menu. This property holds the menu bar that contains this item, or null if the item is not in a menu bar. This signal is emitted when the menu bar item is triggered by the user.